Those of us committed to numismatics as a hobby has recently seen terms thrown around about a challenge coin that is more damaging to the hobby than anything that has been argued amongst ourselves. 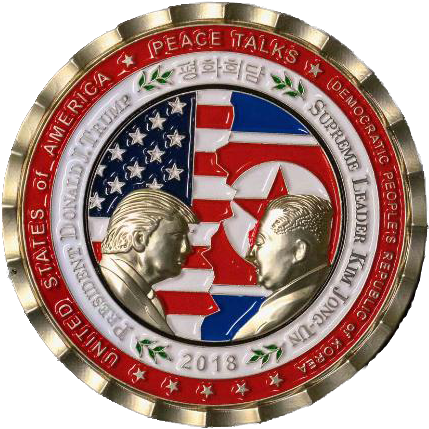 The challenge coin in question was created by the White House Communications Agency (WHCA) for the now-canceled summit between President Donald Trump and North Korean Supreme Leader Kim Jung-Un. The partisan nature of our national politics and now the status of the summit has created a false narrative about the challenge coins that do not do the hobby any favors. To set the record straight, a challenge coin is not a coin. A coin is a disk, usually made from metal, formed into a disk of standardized weight and stamped with a standard design to enable it to circulate as money authorized by a government body. In the United States, only the U.S. Mint is authorized to manufacture coins. Challenge coins are medals with an organization or event logo or emblem that are part of a tradition to honor service. Challenge coins are part of a military tradition that started during World War I when Ivy League students went to war and created these coins as an act of camaraderie. According to legend, a World War I pilot was shot down behind enemy lines and captured by German soldiers. Since the pilot kept the coin in a pouch around his neck, the Germans did not confiscate his coin. That evening, the pilot was kept in a French-German town that was bombarded in the evening by allied forces. The pilot escaped during the bombing. During the next day, the pilot came upon a French military unit who was told to watch for German soldiers posing as citizens. To prevent from being arrested and executed by the French soldiers, the pilot showed them his challenge coin. One of the soldiers recognized the insignia and delayed the execution until they were able to verify the pilot’s identity. Once the story spread, a tradition was born! As a show of camaraderie, units began to issue specially designed coins to each other. The challenge came when members drew their challenge coin and slapped it on the table, the rest of the members with them must produce their challenge coin. If someone does not have their challenge coin, that person must buy a round of drinks for the group. The challenge is used as a morale builder amongst the group. Challenge coins regained popularity around 1991 with the veterans and descendants of the Pacific Fleet honoring the service of those who survived and did not survive on the 50th anniversary of the attack on Pearl Harbor. They saw wider acceptance, especially outside of the military, following the attacks on September 11, 2001. As retired military members began to lead security-related civilian agencies, the use of challenge coins grew beyond the military. The challenge coin in question is the product of a military organization. The WHCA was founded in 1942 as the White House Signal Corps to provide communications for the White House. It is their job to make sure that whenever and wherever the presidents needs to communicate with the government or foreign leaders that he can do so and securely if needed. It is under the jurisdiction of the Defense Information Systems Agency (DISA). This is not the same agency as the White House Communications Director. That position was vacated by Hope Hicks in March 2018. White House Press Secretary Sarah Huckabee Sanders would report directly to the Communications Director, not the WHCA. Since 2003, WHCA has created challenge coins for nearly all overseas travel by the president. Only the secret travels to war zones when the president made surprised visits to U.S. troops were not honored with a challenge coin. In this case, the challenge coin that made the news was made for the members of the advance team whose job it is to make all of the arrangements for a safe and successful trip. The U.S. Mint does not produce these challenge coins. An approved manufacturer is contracted to design and strike the medals. That contractor works with the WHCA to create the design. After the design is approved, a limited number of medals are produced. Everyone who is part of the mission receives a challenge coin. Some journalists who fly on Air Force One may receive challenge coins, most do not accept them. Former NBC News Anchor Brian Williams admitted to collecting Challenge Coins during a broadcast in 2009. The inventory is separated to make sure that enough challenge coins are available to everyone making the trip and a few who were left behind on support duty. For example, one is probably set aside for Sarah Sanders who does not travel as much. As the first Press Secretary who is a mother with children still at home, she understandably stays nearby to care for them. The rest are offered for sale in the White House Gift Shop. The White House Gift Shop (WHGS) is located in the White House and open to anyone able to visit. It is a separate organization from any of the agencies mentioned. If you cannot visit, everything the gift shop offers is available on their website at whitehousegiftshop.com. This includes challenge coins. Reporters covering the White House spotted the WHCA Challenge Coin in the WHGS, took a picture and used their social media access to report its existence. Irrespective of the political arguments being made over the subject matter, there is nothing illegal or morally wrong with the challenge coin. Although government funds were used to create the coin, those funds are included as part of the budget passed by Congress. Yes, the WHCA has a budgetary line item for the creation of challenge coins to help with the morale of the military detachment to the White House. One of the reasons I looked into this issue was to find out who designed the coin. The artist did such a good job that I would recommend that they apply for the Artistic Infusion Program with the U.S. Mint. It is a fantastic representation for those participating as part of the advance team. The artwork and symbolism were really nicely executed. Using the enameled flags in the background leaving the two leaders to stand out without the enameled finish has a strikingly good look. It is one of the best design I have seen for a challenge coin representing an event. This challenge coin is no longer for sale in the WHGS. The webpage for the medal was changed to note that a new challenge coin will be designed for the event by the same artist who designed the WHCA challenge coin. The CEO of the WHGS published a note saying that the new challenge coin will be similar to the WHCA challenge coin. If you are interested, you can order one from their website.